Here at Trillium Dental in Ottawa, our family dentists take great pride in providing their patients with exceptional dental services. We understand that not everyone loves going to the dentist, and if this sounds like you, you certainly aren’t alone. Everyone is welcome at Trillium Dental, whether you are switching dental offices or are new to general dentistry altogether, and we will stop at nothing to make you feel right at home in our dentist’s chair. 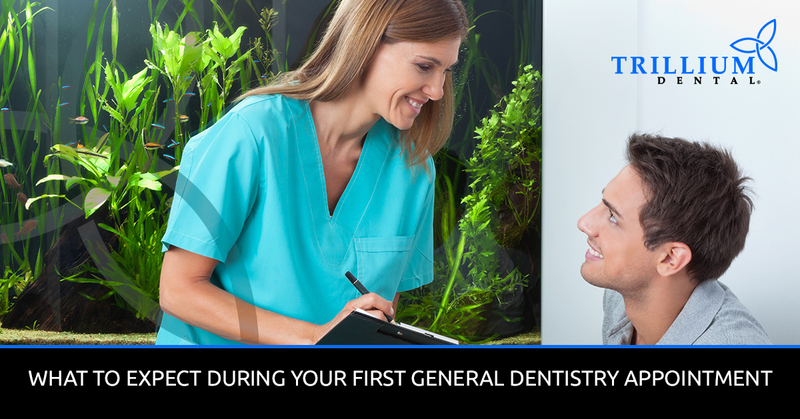 We want all of our patients to know what to expect during their first dental visit, as this can help ease some of the anxiety you may be feeling as you prepare to have someone new clean your teeth. That being said, here is what an initial general dentistry appointment at our Ottawa dental clinic entails! As a family dental clinic, our dentists take all the precautions necessary to ensure that your teeth and gums are healthy before moving on to any dental cleaning, flossing, or fluoride application. Upon arriving at Trillium Dental for your first general dentistry appointment, we will conduct a thorough inspection of your oral cavity, which includes an oral cancer screening and a periodontal screening. This allows us to become aware of any underlying issues you may be experiencing so that we can proceed accordingly with gum treatments or an oral cancer treatment referral if need be. More often than not, this is not the case, and we will move on to X-rays. Dental X-rays allow our dentists to inspect your teeth and gums in a way that is not possible without the most advanced dental tools and technology. We will have you bite a small plastic strip on one side as we snap the photo, then switch over to the other side and repeat the process. While this only takes a few seconds to complete, it is critical for us to identify any tooth or jawbone decay, tumors, abscesses, and other issues that may have gone under the radar during the periodontal and oral cancer screenings. After completing the preliminary dental screenings and X-rays, your dental hygienist will perform a thorough dental cleaning. This includes a tooth scaling treatment, during which your dentist will use a dental scaler to gently scrape away any plaque and tartar that has built up along or below the gum line. If you have a significant amount of tartar buildup under the gumline, we might clear it out using the Cavitron®, a device that uses gentle ultrasonic waves. Then, they will use a high-tech electric toothbrush to completely clean your teeth from front to back, reaching all the crevices you can’t get to with the standard toothbrush you have at home. Once your pearly whites are clean and shiny, we will floss between each of your teeth, watching for sticky areas that might indicate a cavity. If all is well, we may then apply fluoride to the teeth, let it sit for a minute, rinse it away, and send you off to continue going about your day! We hope this information has given you a good idea of what to expect during your first general dentistry appointment, and that you will choose Trillium Dental in Ottawa as your trusted family dental clinic. We look forward to meeting you and providing you with exceptional dental care, so make an appointment today!